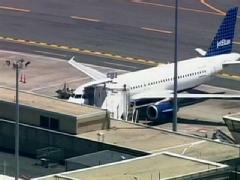 Massachusetts State Police arrested a man on Assault & Battery Charges this morning at Boston’s Logan Airport for having allegedly slapped a flight attendant on a JetBlue flight from Florida to Boston. The Clerk-Magistrate of the East Boston Division of the Boston Municipal Court, however, declined to issue charges against the man for lack of jurisdiction. Bryan Garnett, the passenger on the JetBlue flight to Boston, allegedly slapped a flight attendant who ordered that he move his carryon luggage beneath his seat. The incident allegedly occurred before the flight took off and while the plane was still in Florida. Upon the flight’s arrival Boston, Massachusetts State Police arrested Bryan Garnett for Assault & Battery. Following his arrest, Massachusetts State Police sought an application for a criminal complaint to be issued against Bryan Garnet for Assault & Battery, but the Clerk-Magistrate declined the application for “jurisdictional reasons” – i.e., that the alleged incident did not occur in Massachusetts. Boston Criminal Lawyer Lefteris K. Travayiakis has extensive experience in defending against Massachusetts Crimes of Violence, including Assault & Battery, and is available 24/7 for consultation.